Here's a little peek inside our Presentation Pack service, which has been enabling busy newspapers to sell a large contract every week with minimal work. This is the first video of this week's series on selling an RV dealer a large ad on contract. It refers to some of the techniques in my Response Oriented Selling course, but still, it should help even those unfamiliar with my techniques. 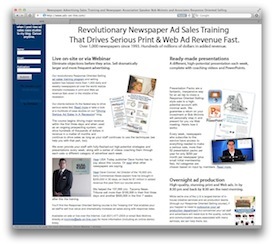 Find out more about how my newspaper ad sales training programs can help you or sign up for email notifications and learn when new case studies, free videos, and other resources become available that'll help you and your staff sell more advertising. We'll never share your address and you can unsubscribe anytime.